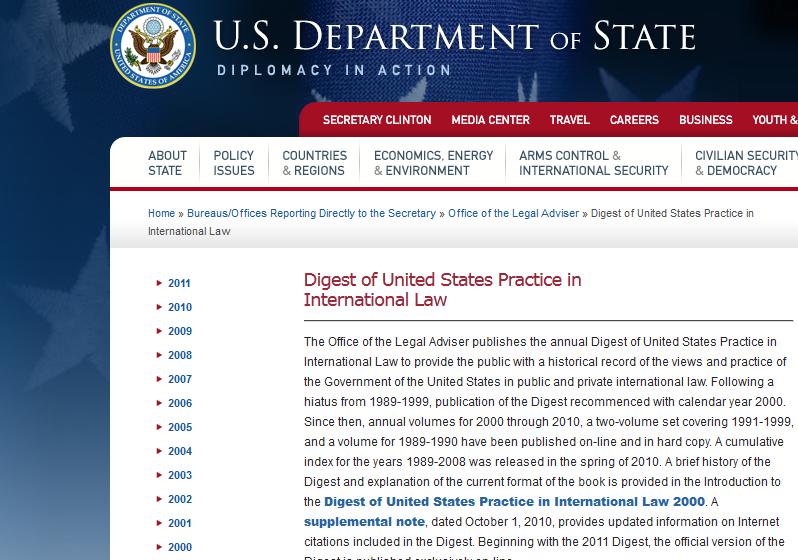 I'm pleased to announce that the U.S. Department of State has just released the 2011 Digest of United States Practice in International Law, covering developments during 2011. The Digest is edited by the Office of the Legal Adviser; yours truly had the honor of serving as editor of the 2011 Digest, which is available online here. 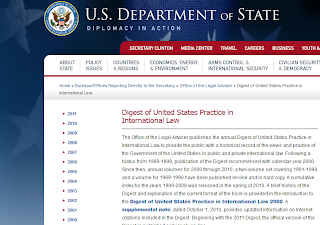 The digest provides the public with a record of the U.S. government's views and practice in public and private international law. As IntLawGrrls previously posted, the digest traces its history back to an 1877 treatise by John Cadwalader, which was followed by multivolume encyclopedias covering selected areas of international law. Later, it came to be known to many as “Whiteman’s” after Dr. Marjorie Whiteman, who was the editor from 1963-1971 and whom IntLawGrrls honor as a foremother. Beginning in 1973, the Office of the Legal Adviser published the Digest on an annual basis, focusing on documentation current to the year. Although publication was temporarily suspended after 1988, the office resumed publication in 2000, and has since produced volumes covering 1989 through 2011. A cumulative index covering 1989-2006 was published in 2007, and an updated edition of that index, covering 1989-2008, was published in 2010. Past digests, covering 1989 through 2010, are available online here.